-The open design provides clear view of the entire classroom. -Soft rubber edge trim for comfort and available in multiple colors and finishes. Gentle contours on the edges and rounded corners coupled with the 16 & 18 gs. steel frame ensures safety and comfort for all users. The footrest is the key to standing comfort. Our patented design utilizes multiple depths and two heights to support the users feet while sitting and standing. The chrome plating ensures lasting durability and easy maintenance. - The round top with waterfall edge and surface texture for grip are coupled with four tubular steel legs that provide easy adjustability over the full range of student sizes. 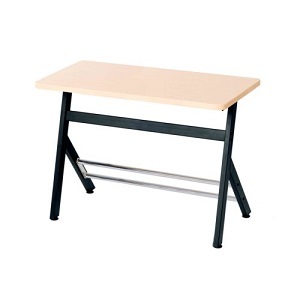 Stand2Learn desks are made out of durable materials (steel & HDPE) designed to last a lifetime and is easy to assemble. Desk Height: 27" - 28"
Top Size: 20" x 42"
Footrest Height: 5" and 9"